I’ve finally found it! 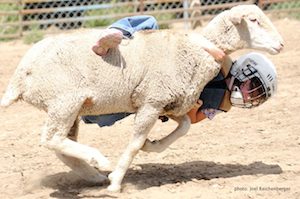 Here’s the first thing that’s made me say, “no way my kid’s doing that.” It’s mutton busting. We didn’t know anything about it before we showed up at the Routt County Fair last weekend. I saw it listed on the day’s schedule of events: Mutton Busting, open to kids 3 through 7. Hmm, I thought. My daughter qualifies: She’s three. Should be fun. “Next year,” we assured her. “You watch it once, and then next year you’ll know what to do.” Except I’m pretty sure there’s not going to be any next year—not for this family, anyway. A trailer full of sheep was parked beside the pen where kids would try to cling, for as long as they could, to the shorn backs of frenzied, 160-pound ewes. Four burly men were assigned the brutally physical task of herding the animals one by one into the staging pen. It looked like a Sumo match, except it was crouched man against lunging sheep. The teenager standing in the trailer with sheep got stampeded when they bolted, en masse, for the open door. Kids were fitted with full-face helmets and chest pads. Ben and I exchanged glances. The first tot was loaded onto the sheep’s back, the gate sprung open, and the kid promptly landed in the dust. The second kid emerged from the pen riding backwards, ankles locked around the sheep’s neck and hands gripping its haunches. He rode to the end of the pen before he was bucked. All good. Then the wreckage really began. One kid’s head got stuck between the bars of the pen as the sheep bolted out. Another landed so hard, she was carried away. She soon joined her family beside us on the bleachers, crying as she held a paper towel over a bloody nose and complaining that her back hurt. Hm. Another kid was also carried out after he couldn’t stand up on his own: The sheep had stepped on his thigh during the fracas. “The trick is, you can’t let them see what’s going on until it’s their turn to ride,” I overheard one mother say as I waited for my hot dog at the American Legion lunch trailer. Her two kids wore red “Mutton Buster” t-shirts, and had emerged from the stunt unharmed. But as she described other injuries—ones I hadn’t noticed from my seat in the bleachers—the tally started to seem like an awfully heavy toll. Suspected concussions. Suspected bone breaks. Nope, I decided. Simone’s not going for that shirt. Maybe if she were a farm kid, the type who’d grown up riding beasts the way my daughter grew up riding bicycles, who’d developed the instinct for how an animal moves and how to separate yourself from its bucking mass before disaster strikes--maybe then she would be ready for such an arena. Click here to browse more of my family blog posts for the Steamboat Today and exploresteamboat.com. For two years, a parade of excuses stymied our plans to take Simone backpacking. 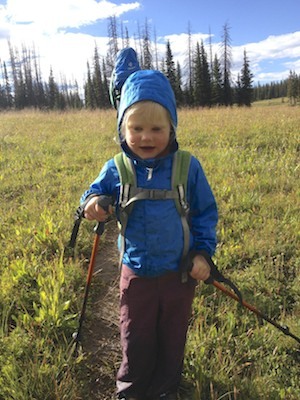 We bowed to the threat of high-country mosquitoes, and reconsidered in the face of stormy weather (Simone relishes rain, but I dreaded being holed up in a tent with Miss Antsy Pants). Grampie’s recent visit from Maine put another backpacking trip on the calendar just as repeated rains were making Steamboat seem like Seattle, so it seemed as if that hike would get nixed like all the rest. But for some reason, I felt a new determination to scratch this milestone off the list no matter what. Clearly, we weren’t going to get the idyllic conditions we’d envisioned for her first backpacking adventure. It was time to just make it happen. Lake Dinosaur was our destination. It’s a long drive (a good hour and 20 minutes from town via the degraded Summit Lake road) but a short hike (less than a mile over flat terrain). We’d amassed a great crew: Grampie’s cousin Jeff Russell joined us from Winter Park. But the scene at the trailhead seemed inauspicious. With the five of us huddling inside Jeff’s truck, waiting out a lightning storm before attempting to hike across open meadows at 10,000 feet, I secretly wondered if I was being mulish. “You really think this is a good idea?” Ben asked aloud as rain sheeted across the windshield. But within 20 minutes, the skies had cleared. We tromped over the puddle-ridden path to Lake Dinosaur, set up a picture-perfect camp amidst the spruces bordering the water, and savored one of the most beautiful evenings I’ve ever enjoyed in the high country. Rain-soaked grasses glittered in the evening sun. Simone, Grampie, Jeff and I scaled the cliffs lining the lake while Ben cast for brook trout. Mist rose over water that reflected the sky’s transformation from blue, to pink, to orange. To have cancelled this date with nature would’ve been a crime. --Keep meal prep simple. The empty fuel canister did put the kibosh on hot, tasty food, but because I wasn’t laboring over a stove, I was free to join my daughter on fun explorations around the lake. I’d say I traded up. --Choose uber-short hikes. Three-quarters of a mile was all Simone needed to experience the satisfaction that comes from carrying your camp on your back. --Keep outings brief. You can handle any weather—enjoy it, even—when you’re only out for one night. I’m glad we didn’t stay home when rain threatened. I’m equally glad we hadn’t attempted a four-night epic. --Keep kids comfortable. I wish I’d thought to pack Simone’s rain boots (as I’ll do on all future camping trips) but she did have quick-dry nylon hiking pants and a great rain shell that let her enjoy herself through showers and sunshine. --Don’t wait for perfect. The stars rarely align to guarantee ideal conditions for backpacking, paddling, camping or anything else. Go anyway. An imperfect reality is always better than unrealized ideals. I didn’t expect to like Yvon Chouinard. Everyone respects him, of course, not just for founding the Patagonia clothing company, but also for pioneering big-wall climbing and whitewater kayaking. Yet folks who’d fished with him in the Bahamas and worked with him at Patagonia described a curmudgeon whose pessimism had a way of dousing any merriment around a campfire or water cooler. 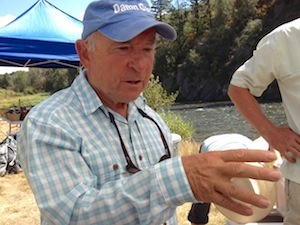 When I had the opportunity to fish alongside Chouinard on Idaho’s Fall River last September, I expected to learn tons. What surprised me was just how jolly he was. “Well good morning, Hugh Heffner,” Chouinard teased when I wore my pink, flowery pajamas into the kitchen to claim my morning cup of coffee. Through my pre-coffee fog, I matched his grin. He cracked lots of jokes over the two days he spent introducing me (and eight other women) to Tenkara fishing. He made light of the techniques he was teaching: “Fish can’t resist this. 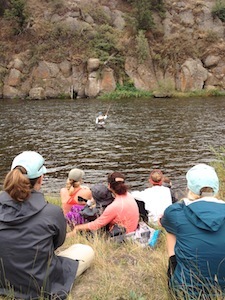 It’s like a lap-dance for trout.” He joked wryly—never bitterly—about getting old (he’s 76). Eventually, it occurred to me that Chouinard likes women. Is genuinely at ease with them, in fact. That’s pretty rare, I find. Men may like ladies, and some sure like looking at us, but it’s uncommon to meet a man who’s completely comfortable in a room full of women. Chouinard is one of those. Never domineering or patronizing, he chatted easily with us about fishing, grandkids, mountain-town living, and collecting skills rather than gear. "Of course I'm a pessimist," he answered when I asked him about his reputation. "There's no reason to be optimistic about our environment." But he also demonstrated that he's plenty capable of having fun. He appeared to truly enjoy our company, which may be the biggest reason I like him. So when I say that Yvon Chouinard is a ladies’ man, I mean it as the highest praise.